Gluten Free Oats: Is There Such a Thing? Gluten Free Oats: Are They Real? Are oats gluten free? No, most oats are not. In fact, you may have to search to find gluten free oats because there aren’t that many producers who go the extract gluten-free mile. Remember the acronym B-R-O-W-S I shared with you to help you understand where gluten generally occurs? Oats always has an asterisk next to it because it needs some explaining. The purpose of this post is to clearly explain why oats can be gluten free AND why you’ve got look for a label that clearly states “gluten free oats”. Do Gluten Free Oats Exist? Generally, oats are grown in fields next to those of wheat. They are both harvested and processed on the same equipment. Thus, the oats become contaminated since they intermingle with wheat. Regular oats are therefore off limits to anyone who is sensitive to gluten or celiac. Please don’t mistake what I’m saying here. You can surely eat oats, but you’ve got to find a producer whose packaging is clearly marked ‘Gluten Free’. I’d also like to note that there is some debate about whether those diagnosed with Celiac Disease can tolerate gluten free oats. It appears that not every celiac can which is why any product which is certified gluten-free by the Celiac-Sprue Association will not have oats in it. I don’t know many options for gluten free oats simply because it takes a great deal of commitment on the grower and producer end to bring gluten free oats to your table. However, there are a few options out there that you can try. 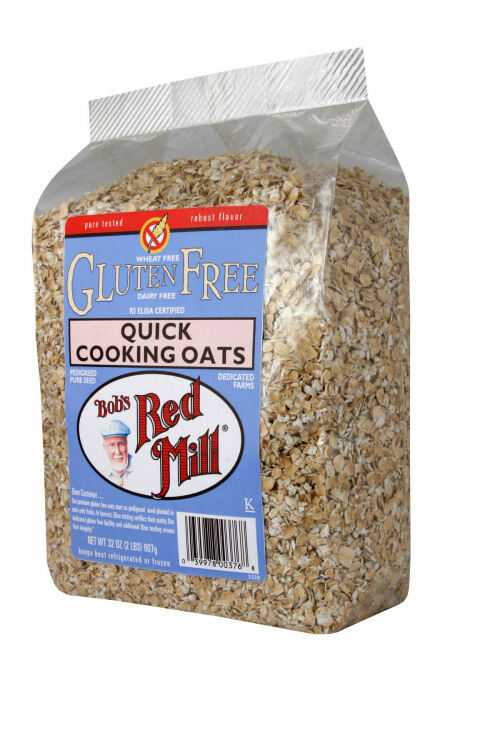 One of the best known and most affordable brand is Bob’s Red Mill. I personally use their gluten free oats and have never experienced any sort of issues with their products. The bags are clearly marked and can be found in a wide variety of supermarkets. They carry three different types of oats (Quick-Cooking, Rolled & Steel Cut) which are all Gluten Free. If you have any questions, their customer service seems to be incredibly helpful. Hi Anne! Some people do. It really depends on your unique body. For those who aren’t reactive, it’s important for them to know that the oats must be marked Gluten-Free. Bob’s Red Mill Oats are the greatest! I use them in baking and hot cereal all the time. I never knew why they were off limits until this post. Thanks for the knowledge!! Wow, thanks for the cool link to the Quinoa Queen! The recipes look delicious! If you want to eat clean oats write to or google Cream Hill Estates and orderLara’s Rolled Oats. I believe they come from Canada but can’t find the paperwork that came with them. My sister found them online and although she and I can only eat them infrequently, they appear to be clean as they advertise which is not always the case with Bob’s Redhill. Oats. I purchased an oat flaker online years ago before Bob’s Red Mill came out with GF oats and have never noticed a reactive to gluten problem eating those I process even though our son and I have celiac disease. I purchase organic oat groats in bulk from the local food coop. I realize they may be cross contaminated, but didn’t realize the growing field for both could likely be right adjacent to each other. The groats themselves, however are uniform and all look like oats instead of wheat. The oat flaker is easy to use and quick. My spouse uses it to make his own oats about once a week to create his weekly supply. I now rarely eat them due to my eliminating almost all carbs to get my glucose levels under control after a prolonged major stress event that ended one year ago. .